The Sellaronda is a ski route that loops around the massif of the Sella mountain range, of the Dolomites. It is truly one of a kind with its network of lift facilities in a setting surrounded by rocky peaks, thick forests and snow-covered landscapes. Completing the Sellaronda loop is quite easy and very gratifying, all you need to do is reach one of the four main starting points located around the Sella massif. The main starting points are Val Gardena, Corvara, Arabba and Canazei. They are all linked together by numerous lift stations. The total distance of the loop, including lifts, is about 40 kilometers and since the level is considered to be medium-high it is advisable to be physically fit and have a good knowledge of skiing. Approximately 2 hours are spent on lifts, without taking into consideration time spent waiting in queues and stopping for breaks at the numerous huts and lodges along the way, therefore it is advised to start the route no later than 10:00 a.m. and furthermore it is extremely important to complete the last pass before 3:30 p.m. otherwise you risk having the lifts close before you arrive at your original departure point. 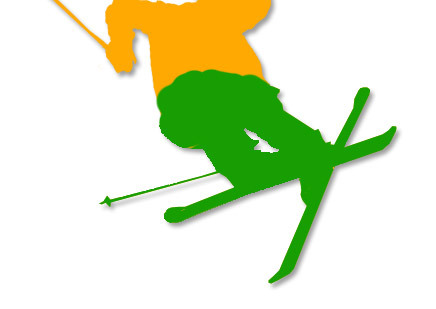 Actual ski time is around one and half hours if the pistes are done consecutively, although this depends largely on each individual skier. In our portals you will find the following informations: A list of accommodations, like hotels, boarding houses, garnis, residence, apartments and mountain inns in the Dolomites of the Sellaronda. The complete list of the events in the Dolomites of the Sellaronda. Worth seeing Places in the Dolomites of the Sellaronda. Tourist informations, like: snow info, traffic info, usefull phone numbers, shopping info, skiing, ski schools, taxi services and more. All informations of the Dolomites and the Sellaronda. Find your Job in the Dolomites by visit our free Job service for the Dolomites Job.bz.it The Sellaronda is marked on the map as follows: orange for the clockwise direction and green for the counter clockwise direction. The clockwise route of the Sellaronda, marked on the map in orange, begins in the center of Selva di Val Gardena. Take the chairlift Costabella to the Dantercepies cable car that goes up to Gardena Pass, then follow the slopes to Colfosco where the chairlift Borest takes you to Corvara, after which take the cable car Boè to get down to Campolongo Pass. The pistes lead to Bec de Roces where the route for Arabba begins. Once you’ve arrived in Arabba, take the cable car that goes to Porta Vescovo then ski all the way down to Pont de Vauz. From there, the chairlift at Fedom will take you to Pordoi Pass. After a short distance you will come to the chairlift Lezuo that goes to Belvedere, continue the descent until Plan Frataces where you’ll find Lupo Bianco and from there you take a gondola and charilift up to Rodella Pass – Sella Pass. A gorgeous long slope leads down to Selva di Val Gardena. This route covers approximately 13.518 meters with lifts and 23.100 m of actual downhill skiing making a total of about 37 kilometers. 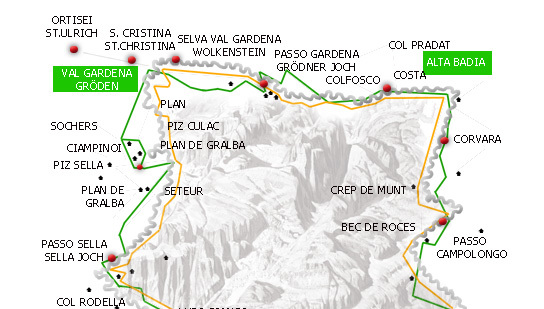 The counter clockwise route of the Sellaronda, marked on the map in green, also begins in the center of Selva di Val Gardena by taking the cable car Ciampinoi and following route 5 till Plan de Gralba. Once you’ve arrived there, you take the chairlift Piz Seteur, go down a short distance to get to the chairlift Sassolungo where you find yourself literally at the base of Sassolungo. Next, go through “boulder city” till you get to Sella Pass, from there take the charilift Sasso Levante to Salei valley. In Salei valley you need to go near the end till you get to the cable car Plan Frataces, then continue on to Lupo Bianco towards Kristiania where a 6 seater chairlift will take you to the Sas Becè lodge. The next long descent will lead you straight to the ski center of Belvedere in Arabba. To get to the chairlift that will take you to Bec de Roces, you must first walk across the road, not ski. At the end of the descent you will come to Campolongo Pass where you will get the charilift to Crep dl Mont after which you will continue down to Corvara. Two chairlifts run from Corvara to Colfosco where you will then find a long cable car that takes you to Cir at Gardena Pass. Here there is a chairlift from Val Setus that runs to Gardena Pass. Take the next chairlift to Dantercepies and follow the slope that goes through the forest down to Val Gardena. This route covers approximately 15.705 meters with lifts and 22.950 m of actual downhill skiing making a total of about 38 kilometers and 655 meters.